And it has been ... since about 9 o'clock last night. I cannot believe it can rain this much. Catching up on blog posts, and reading the papers. My lunch today was incredible. I have to share it. Spinach salad with grape tomatoes, cucumbers, onions, red and green peppers, red pepper pate (never had it before) olive oil, white balsamic vinegar... and raw crunchy sweet green beans on the side. 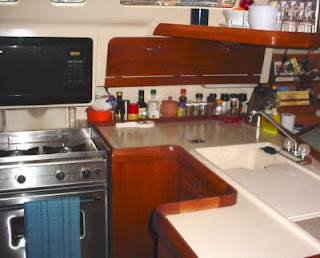 Finally got around to taking some pictures of my little galley and doing a page about it for this blog. Sounds like a nice relaxing Sunday--sorry about the rain! 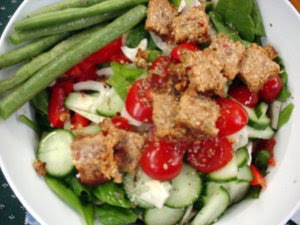 Your salad looks delicious, I eat raw green beans all the time, love them! Thanks for entering the giveaway! That meal would be a perfect one for the cleanse!!! That salad looks super tasty! cute little kitchen! fun to see where you are fixing up your food!